Luxury hotel containing Marco Pierre White restaurant opens in the Welsh capital with ribbon cutting ceremony. Cardiff’s latest hotel marked its official opening with a visit from the Lord Mayor of Cardiff. Councillor Bob Derbyshire also helped mark the opening of Hotel Indigo Cardiff with a ribbon cutting ceremony. 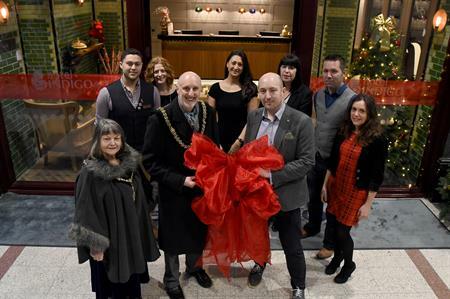 Hotel Indigo Cardiff’s general manager, Tom Gaskell, said: "I would like to thank the Lord Mayor of Cardiff for taking the time to visit the hotel and help us mark its official opening. We were really proud to show him around so he could see what Hotel Indigo Cardiff will bring to the city, and we welcome him back anytime for a visit." The 122 bedroom hotel contains beautifully decorated guest rooms which were designed to highlight three recurring themes – made in Wales, Welsh industries and music – underlining the heritage synonymous with the local area and beyond.